If you’re after an easy drinking, mellow coffee, our Grande Mild was created just for you. It delivers a less intense experience than our regular Grande, but with 100% Arabica beans, it in no way compromises on the taste or quality you expect from your NESCAFÉ® Dolce Gusto® coffee pod collection. With a delightfully smooth body topped with a classic crema, the Grande Mild is a laid-back choice for any occasion. Made with smooth Arabica beans and bursting with coffee shop quality, this one will have you kicking back and relaxing in no time, whether you enjoy your Grande Mild with breakfast or later in the day. Crafted to the highest standards, we think you’ll be the envy of your friends with this unmissable little coffee capsule. As well as delicious for coffee enthusiasts, this one’s particularly good for the occasional coffee drinker who doesn’t fancy anything too intense, but still wants to enjoy the unmistakable taste of a NESCAFÉ® Dolce Gusto® coffee. The high quality of your machine ensures the very best outcome, but to make it your own, finish this one off however you like: keep it simple and drink it straight, or add milk to taste. If our Grande Mild is your everyday coffee of choice, we think the Lungo Mild is the ideal companion. Tried the Grand first and found it to strong so decided to try the grand mild. Right decision for me as I find the americano slightly weak and the Grand to strong. So this is my favourite black coffee. 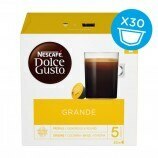 Dolce Gusto best ever coffee and fantastic company who never fail to deliver just when you need it. I don't shop anywhere else for my coffee and that includes their gorgeous cappuchino too,well done and merry christmas to all. This is just pure coffee heaven. Perfect on it's own but if you prefer a longer drink heat some milk in the microwave and add the coffee. I like this Grande Mild Coffee as its a decent alternative too the stronger Grande as i enjoy coffee without milk or sugar. This is a lovely coffee that is full of flavour without being too strong, perfect accompaniment to a piece of cake! I love this coffee this is for when I find ten minutes to be on my own. The taste is so smooth yet rich not bitter mild but still intense. I love this and do not share it with anyone. My ten minutes of heaven!